“When I design patterns, I really want them to be made up more than once. 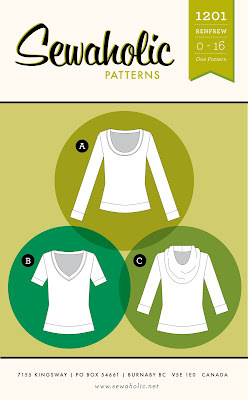 That’s why I offer one or two variations to the basic design, and also plan the patterns around using a variety of different fabrics… The Renfrew Top pattern can be used to make nine different tops! And that’s just variations on pattern pieces. Fabric, embellishments, contrast, applique – there are so many cool ways to make the same pattern look completely different. The deadline to enter is Thursday 5th April 2012 at midnight GMT. The winner will be selected by random number generator and announced on this blog on Friday 6th April. The giveaway is open internationally and includes shipping. Don’t forget to leave your email if it’s not linked to your blogger profile so I can let you know if you win. One Week, One Pattern: Details!